bl.uk > Online Gallery Home	> Online exhibitions	> Asia, Pacific and Africa Collections	> Killadar's Tomb, Ouscottah. Plate twenty six from 'Picturesque Scenery in the Kingdom of Mysore' by James Hunter (d.1792). 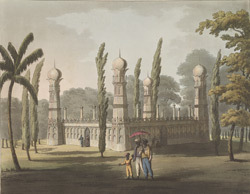 This aquatint, which is based on a picture by Hunter, shows a mosque in the foreground anda walled town in the background. Hunter served as a Lieutenant in the Royal Artillery and his sketches portrayed aspects of military and everyday life.